This summer the Museum presents an exhibition that honors Connecticut and New York’s contributions to the history of maritime travel and trade with the exhibition, "All the Sea Knows: Marine Art from the Museum of the City of New York." On view June 6 through September 20, 2015, All the Sea Knows combines paintings and decorative arts objects from MCNY’s remarkable yet seldom-exhibited maritime art collection with paintings and artifacts drawn from the Florence Griswold Museum’s collection. The exhibition takes its name from Carl Sandburg’s poem “Sea-Wash,” and juxtaposes works of art with salient passages from literature to convey the many and varied ways that Americans have embraced the sea. All the Sea Knows features works by famed nineteenth-century American painters James Bard, James Edward Buttersworth, Thomas Chambers, Edward Moran, Fitz Henry Lane, and many others. Brought together, these paintings reveal the genre of marine art to be as varied as landscape painting. Co-curated by FGM Curators Amy Kurtz Lansing and Benjamin Colman, All the Sea Knows touches upon broad themes of American life. The marine art and artifacts reveal the economic and social transformation of America in the nineteenth century—a society assuming its place in a wider world, assimilating industrial technology in the transition from sail to steam, and tells the story of packet shipping through portraits of its ships and captains. 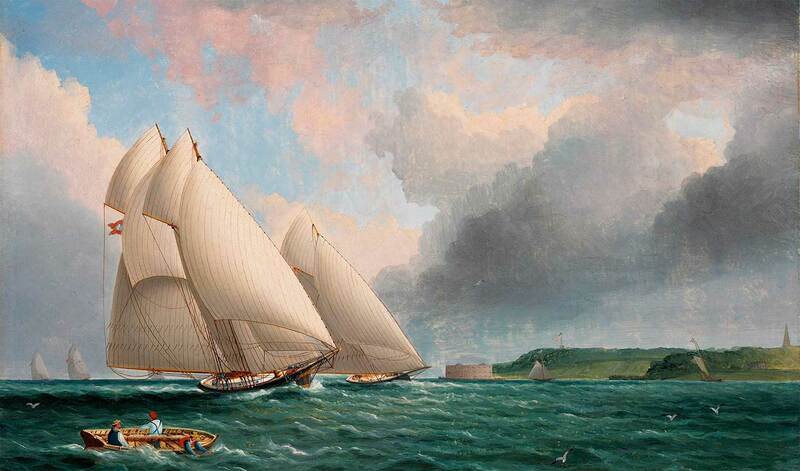 James Edward Buttersworth (1817-1894), Race Off Fort Wadsworth, CA. 1870 H: 9 1/4 in. Museum of The City of New York. Gift of Mrs. Walter D. Fletcher, 1962. A special gallery in All the Sea Knows unites for the first time a group of related paintings from the collections of both museums depicting ships that sailed for the Black X Line from New York to London. Along with a number of prominent mariners from Old Lyme, Conn., Florence Griswold’s father Captain Robert Harper Griswold enjoyed an illustrious career as a captain of several Black X Line ships. 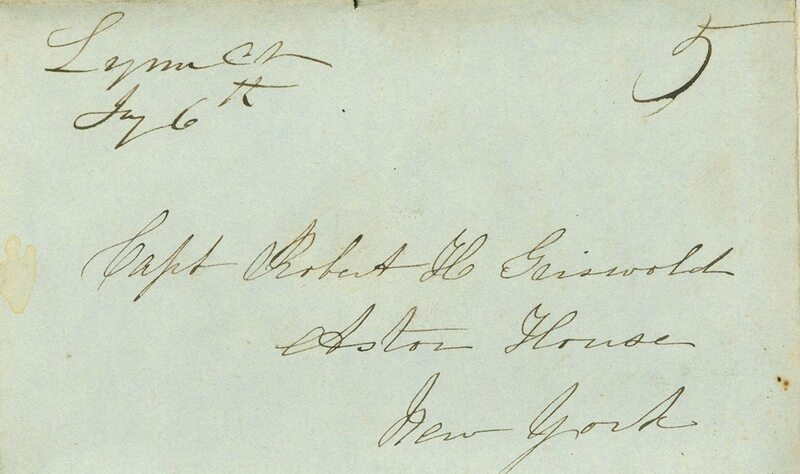 All the Sea Knows debuts a series of letters to Captain Griswold from his wife, Helen Powers Griswold. The intimate correspondence provides insight into the lives of sea captains and those left behind, as well as conveying how the shipping industry affected the entire shoreline community. “When we first began discussing this exhibition with MCNY’s Director Susan Henshaw Jones, I was thrilled to realize that our collections had complementary pieces that, if brought together, could tell the fascinating story of just how closely Old Lyme and New York were connected by commerce and trade in the nineteenth century,” noted FGM Director Jeff Andersen. “This is just one of the revelations of this exhibition,” he added. Edward Moran (1829-1901), State of Liberty Enlightening the World (The Unveiling of the State of Liberty), 1886. Museum of The City of New York. Gift of J. Clarence Davies, 1934. So-called “packet” ships such as the Toronto and the Sweepstakes (in paintings by J. Macarthy and Fitz Henry Lane) linked America to Europe and the Far East. Sailing set routes on a schedule, they moved not only goods, but also people and information in the form of newspapers and letters. 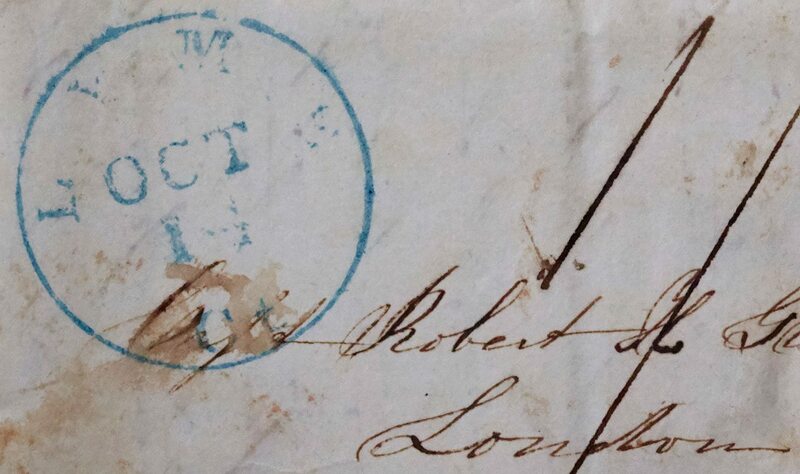 The packet trade provided essential links between far-flung ports in the early years of a globally connected world. All the Sea Knows provides a glimpse into the waves of immigration that America experienced in the mid-19th century. Packet ships, including those depicted in this exhibition’s portraits of Black X Line ships, carried settlers in search of farmland in the American West. 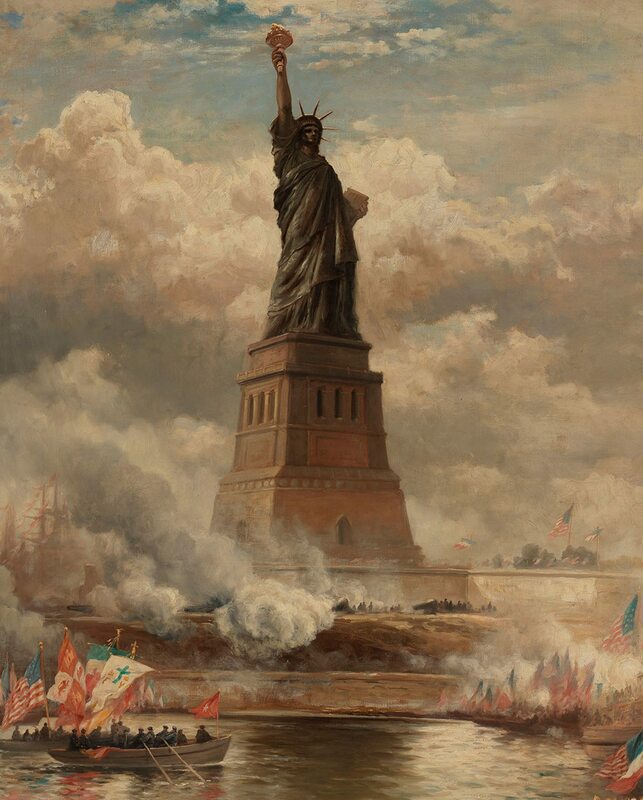 Edward Moran’s Statue of Liberty Enlightening the World, showing the monument’s dedication in New York Harbor, celebrates the connection between immigration and the vitality of American values. America’s expanding population matched the expansion of its territorial footprint. The exhibition draws attention to nineteenth-century views of American imperialism through paintings such as Fred Pansing’s panorama, Sampson and Schley Leading the Fleet into N.Y. Harbor, August 20, 1898, which depicts the fanfare following the United States’ victory in the Spanish-American War. The middle section of the exhibition documents the transition from sailing ships to steam powered vessels, which changed the ways people, ideas, and goods traveled over the course of the nineteenth century. At the start of the nineteenth century, nautical trading routes that brought agricultural goods from the interior of the continent to the coast by a network of newly-constructed canals and rivers, and then on to the international market by sailing vessels, created immense prosperity in major ports like New York. Steam power transformed river and coastal travel from an arduous undertaking with unpredictable timing into a comfortable and pleasant event. Riverboats like the Mary Powell, decked out with playful fittings in the latest styles, made scenic travel accessible for the flourishing middle class in rapidly growing cities. 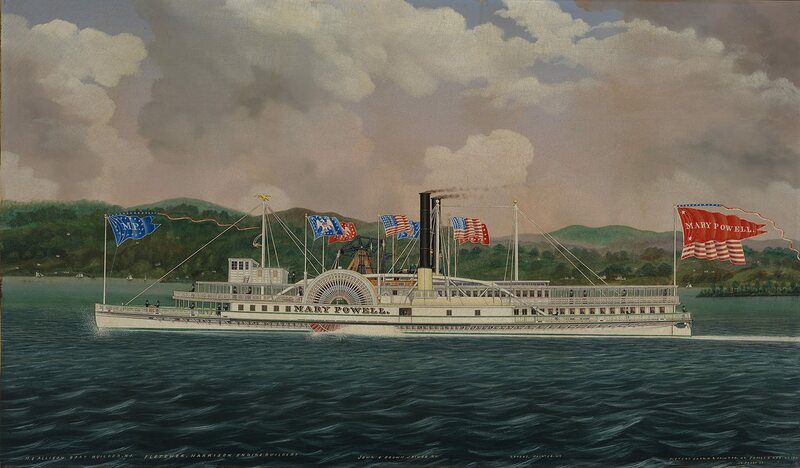 When steam proliferated for coastal and river travel, the captains of American industry and finance rediscovered sailing as a leisure activity. Luxuriously appointed yachts were built in the United States as early as the eighteenth century, but never in significant numbers until the second half of the nineteenth century, when a group of yachtsmen in New York established clubs and prestigious races. Sailing, once a necessity of daily life on the coast, became a competitive hobby for the wealthiest Americans as steamships and trains took the place of masted ships for travel. James Edward Buttersworth’s Yacht Race Off Fort Wadsworth captures the excitement of the newly popular sport. Connecticut’s coastal towns played a key role in international commerce through the captains who made their home there when not traversing the globe aboard packet ships. Two of the most prominent lines were associated with members of Connecticut’s Griswold family, including the Black X Line, for which Captain Robert Harper Griswold, father of Lyme Art Colony innkeeper Florence Griswold, sailed. Captains were celebrated for their prowess as navigators and commanders, attaining celebrity for their feats of speed, daring, and bravery. Both entrepreneurs and hosts, they shepherded across the inhospitable Atlantic valuable cargo and people ranging from elite cabin passengers to emigrants in steerage. Portraits of ships and captains tell the story of the Black X Line and packet shipping. 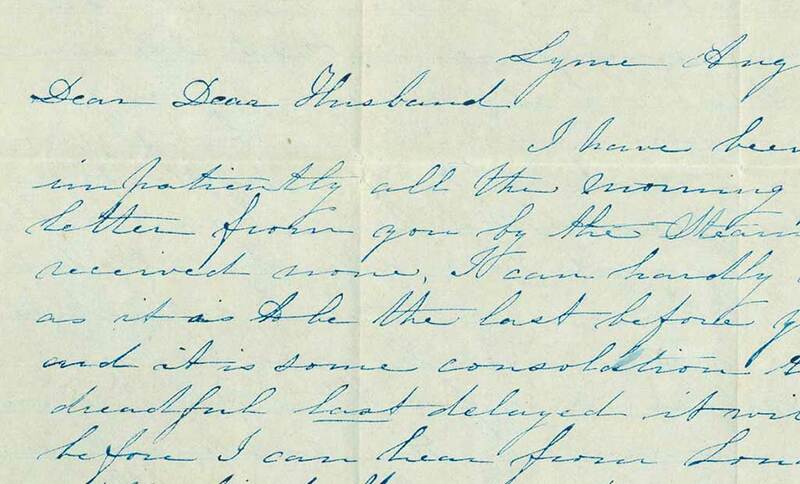 A unique collection of letters written by Helen Powers Griswold to her husband Captain Robert Griswold will be shared publicly for the first time, both online and within the exhibition. These personal accounts capture the texture of life ashore, in which women raised families and managed households during the absence of their mariner spouses at sea. Visitors to the exhibition are invited to step away from the main gallery and enjoy a selection of seascapes from the Museum’s collection that will be on display in the upstairs of the historic Florence Griswold House. All the Sea Knows is the latest in a series of collection-sharing exhibitions that the Museum has undertaken successfully with such museums as the Portland (ME) Museum of Art, the Albany Institute of History & Art, and most recently, the Fenimore Art Museum in Cooperstown, New York. Make Summer 2015 your time to explore the maritime art and culture of southeastern Connecticut through exciting exhibitions of art and artifacts, special events and performances, and popular excursions on the river and sound. The Florence Griswold Museum received funding from the Connecticut Office of the Arts to promote this summer and fall’s activities at three museums—the Custom House Maritime Museum (New London), the Connecticut River Museum (Essex), and the Florence Griswold Museum. Through the project, the museums will promote their exhibitions, programming, and special events that highlight Connecticut’s rich maritime heritage.